In my Monday morning ‘down a rabbit hole,’ I was looking into a local restaurant for dinner with some friends for this evening. 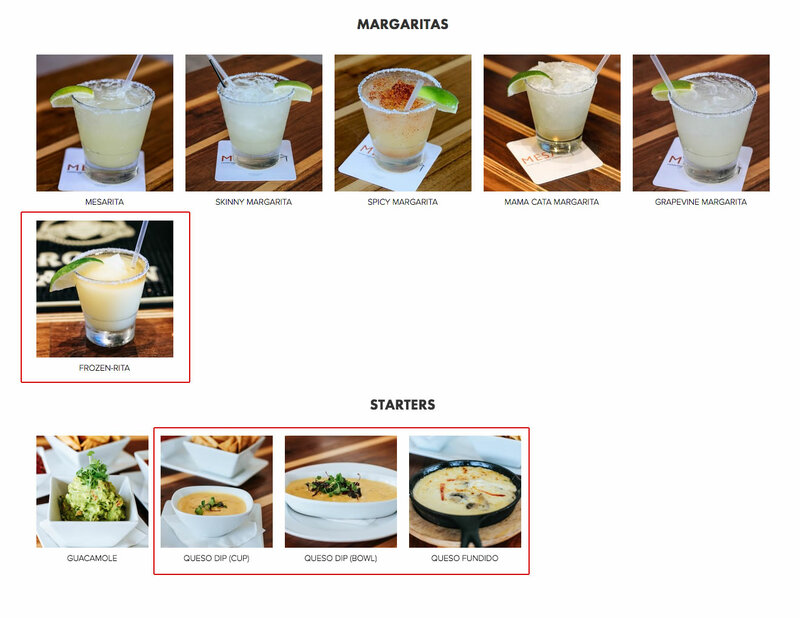 I hit their menu to see if there’s anything that I’d be interested in (there is) and then I got distracted by the rest of their website (as I often do). I ended up on the Blog page wondering just what a local Mexican restaurant might be blogging about these days. Riveting stuff for most of you, I’m sure. While I applaud the efforts of any business to actually take heed of the recommendations we often give in the web world of, “provide your customers fresh and relevant content on your website,” it was easy to see that this blog has just been farmed out to a content factory to generically produce Mexican restaurant/food related content. I’m not dogging the practice or the effort but it doesn’t take an expert to see this content for what it is — in this case, blog posts written more for the SEO (search engine optimization) purpose of getting Google to send them traffic rather than focusing on content written for humans first. The reason for me to come to my own blog and point all of this out? Just to note that if they’re going to continue utilizing a content creation company (which I fully applaud the utilization of a good one for a lot of businesses), I’d at least encourage them to proofread or a least loosely scan the content before (or just after) it gets posted on their website. I only call attention to the fact that they’re pretty clear in the few paragraphs prior, outlining what restaurants a diner should avoid due to the establishment’s inability to be “authentic.” The two that jumped out at me quickly were their points that Mexican restaurants selling ‘queso’ and ‘frozen margaritas’ were obviously inauthentic — and while I’m not here to dispute the authenticity of these statements — I would like to call the attention to their Dinner Menu page where they clearly are not afraid to sell me both queso (multiple types) and frozen margaritas. But hey, something’s better than nothing, right? If you need me this evening, you can find me dinning at the possibly-authentic Mesa Grapevine while sampling some of their finest queso and frozen margaritas. P.S. Mesa, happy to give you a recommendation or two for content creation (or at least proofing help) companies if you’d like! And I don’t always get it right. Even when I’m attempting to do the right thing, I’m prone to fail. To err is human and I’m thankful for grace and forgiveness. The best of what we have to offer. I went to bed last night with a pretty bad taste in my mouth. And unsurprisingly, it wasn’t gone this morning when I arose. If you watched any of the debacle called a Republican Debate last night then you already know that I’m not talking about a literal taste, one that comes from onions or pickles. I endured the mess that was 2.5 hours of adult males (notice I didn’t say grown men) shouting, arguing, and belittling each other at the request of my business partner yesterday who asked me to hold off one more day before venturing down to our local rec center and casting my early vote for the Texas primary. His desire is that by watching one more of the 9 (nine!) debates I would have a clearer picture of who I should be casting a ballot for and hopefully advancing the cause of moving America forward in the coming years. The taste in my mouth this morning should be clear that I do not. I recognize that we are a fairly young nation in the grand scheme of things. If my math is correct, we’re working towards a completion of year 240 this July. But within that 200+ years, we’ve done some pretty cool things. We’ve been innovators. We’ve been leaders. We’ve been peacemakers (and sadly, war-makers). We’ve been care givers. We’ve been invitors of people. We’ve raised up men and women who have done great things and who have set even better examples. We’ve ushered in change, though sometimes slower than some would have like to have seen. Nations have looked to us for guidance, assistance, example, help, protection, and yes, sometimes they’ve looked at us in disgust. Today, I’m pretty sure they’re looking at us quite bewildered. Confused to the fact that what we now have to offer as direction for our nation has been boiled down to a sideshow of clownism, supposed ‘leaders’ who yell at each other and demean each other on national stages in an attempt at a power grab. The mess that is reality TV has now become reality. 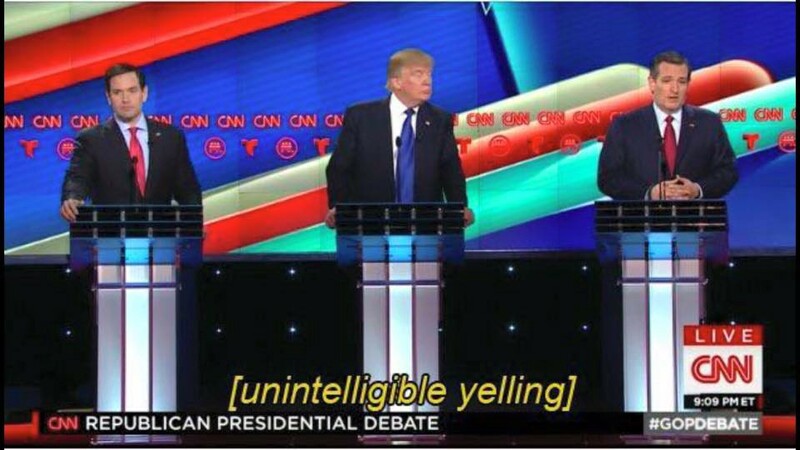 I’ve got to assume that the rest of the world — if they watched that mess last night — understood it in the same way that closed captioning did on CNN, as unintelligible yelling. And what they see today is that America is truly drunk, a laughing stock. And frustratingly for me, what appears to be a stock on it’s way down. As sad as the fact is that these are what have arisen as our best choices, the worst part about the entire thing is that we are egging this mess on. Donald Trump is an absolute mess of a human being and he is polling higher and winning by even greater margins than he ever has. This is a man who is demeaning, misogynistic, racist, crass, rude, filled with very few moral standards (if any at all), quick to lie, and what appears to be full of hatred in his heart; and here we sit supporting him more and more! In states like Iowa and South Carolina, he has actually won the majority of votes of evangelical Christian voters — the ones who should see through his mess more than anyone! This man — one who opens casinos and strip clubs; one who has defaulted on multiple loans and put as many out of jobs as he claims to have given jobs to; one who has broken the law in high-profile ways several times; one who blatantly discriminates; who seems to belittle every person that disagrees with him; that uses wildly inappropriate language while shaming others for doing so — is the man that the church has now decided to rally behind. The same church that was established by Christ, the man who embodies everything Donald Trump is not. The same church that claims to show love, and grace, and mercy to all. The same church that should stand up and be defenders of all those Donald has taken advantage of for the last 60+ years. Shame. Sadly, as bad as it seems with Donald poised to come out on top of this primary season, I’m not in love with anything else that’s still on the table. It’s true, I’d take any of the other four Republican candidates up right now over Donald Trump but that’s like saying I’d take the least moldy piece of bread in the bag. It’s still smells bad and has the potential to make me sick. On the other side of the aisle, my choices are an even-more-corrupt-than-Donald candidate that should probably be spending time in jail for her numerous offenses or an 800-year old kook that would drive our country so much further into debt that we’d end up under the rule of whatever country that decided to call our note in a very short period of time. I’ve always remembered a specific conversation I was a part of in college, one where embarrassingly I got a little heated, one that caused me to think outside of my little bubble, if nothing else. We were in a Bible class and somehow got on to the subject of America as a nation. As a proud American, I was happy to stand firm in my understanding of the greatness of the nation that raised me. We were powerful. We were strong. We were like no nation that had ever come before us. I was 19. Another student in that class — an instigator in my mind at the time — had surely just finished reading Nietzsche or some other philosophy book pointed to the strength and size, and ultimately the fall of the Roman empire. He made arguments that we as a nation were in a similar situation to Rome in their heyday. As I recall it, I quickly jumped into a debate with him to let him know he was most definitely wrong and I’m sure I pointed out to him that if he didn’t like America, he was free to leave. I’m also fairly certain it wasn’t my finest moment. Go ‘merica. Twenty years later, I’m not sure he was totally wrong. Maybe a 240-year run is a good one but now we’re on the doorstep of change. Maybe history does repeat itself and America is the new Rome. Maybe. Maybe not. What it does look like in the short term is that come November, Americans will have the choice between Donald Trump and Hillary Clinton to ‘lead’ our nation for the next four years. If those are our choices, I choose neither. Neither one of those two candidates represent me. Sadly, as backed by current polling and election results, maybe I’m not the representation of America anymore. Maybe America is getting a representation of who they really are, what they deserve. Congrats America, you’ve gotten Idiocracy. Life is most decidedly imitating art. Even more than the question of, “why should I vote for you?” I get asked about my reasoning for running in this election. I’ve given any number of different answers depending on my mood and the situation. As I sit here on the eve of Election Day, I am reflecting back on the last six weeks and all of the highs and lows that have come with it. Since I may never have the chance to speak to everyone directly here in town, I thought I’d list out a few of the reasons why I saddled up for this ride. The following list is probably not exclusive but it feels right for tonight. 1. I am running for myself. This could come off sounding a little selfish but that isn’t my intention. I am running because far too many (including myself) live with an impostor syndrome that is really hard to shake. “You’re not smart enough.” “You don’t have enough training.” “You didn’t go through the right channels.” “You don’t know the right people.” These are the tricks we allow our brains to play on us to create self-doubt and often limit ourselves in terms of what we think we can accomplish. You aren’t alone, many people deal with it regularly. The best way I’ve found to shake the impostor syndrome? Push yourself into territories you never thought you could. 2. I am running for my city. We chose Grapevine. Our decision to call it home was intentional. We plan on being here for a long time. It’s in our best interest to get involved and help Keep Grapevine Great. 3. I am running because I believe we are all called to serve. You don’t have to be on the city council to serve. You can serve your neighbor, your family, your church, your co-workers, people living in distress, the less fortunate, or any number of other causes. When you serve, you get outside of yourself and gain perspective. The opportunities are endless, where do you find yourself feeling the desire to help out? 4. I am running for folks I don’t know. I’ve noted several times during this campaign that there’s a disconnect between the average age of the current city council and the median age of the Grapevine resident. Almost thirty years. That’s a big deal to me. Families in this town deserve to be represented by somebody that understands them and their needs. I am running for my family and I am running for yours. 5. I am running because some people said I shouldn’t. Who doesn’t love a little external motivation? 6. I am running because there’s a few things I’d like to see change. An elected, representative government should listen to – and be held accountable by – the people that elected them. I believe we can do better. If you continue to allow the same folks to be elected, you will continue to get the same results. We can do better. 7. I am running to hear your story. This wasn’t an original reason for me deciding to run but during this campaign I have had the privilege of meeting so many of you and hearing your great stories. Sitting down for meals, coffee, phone calls, emails, I’ve enjoyed them all. 8. I am running for my boys. It’s a little counter-intuitive to think that taking on more responsibility is a good way to teach a lesson to my boys but hear me out. I want them to understand that they can do anything they want in life if they put their mind and efforts to it. The first step will be putting themselves out there and setting a goal. If I can’t model that, I don’t imagine they’ll pick it up all that well. 9. I am running for my business. As a small business owner, it makes sense that I have a vested interest in the future of the city my business resides in. If Grapevine stays strong, my business has a better opportunity to stay strong. In addition, I have a vision for what the next Grapevine can look like business-wise and I’d love to be involved to help put that plan in action. So there you have it, nine things that have motivated me at different points throughout this election season. I’m guessing if you ask me tomorrow, I could probably list out nine more. Tomorrow you have one more chance to help direct the future of your city. Usually the voter turnout in Grapevine is less than ten percent of the population. Will you sit idly by and let others decide your future or would you be willing to take up a challenge from me and get out and make your voice heard? If any of the above has resonated with you, I’d appreciate your support at the polls.